Next month, Apple will ship OS X Lion (10.7). In order for our engineers to be able to develop and test on Lion, we must upgrade to the latest version of Apple's development tools. The new version does not support PowerPC. Therefore we will have to drop PowerPC support entirely for Real Studio 2011 Release 4 due this Fall. Less than 5% of Mac users are still using PowerPC-based Macs and by the time we ship R4 it will have been five years since Apple switched to the x86 Intel processor. I know for some of you this will cause some grief but you can still use 2011 Release 3 and earlier builds to support PowerPC. As you know, we are moving our Mac framework from Carbon to Cocoa. Real Studio 2011 R2 includes greatly improved support for Cocoa. Many users are telling us they can ship their apps built with our current Cocoa-based framework. We believe that our Cocoa support will be complete enough to no longer be considered beta starting with Real Studio 2011 R4. At that time, Carbon will be deprecated. That means we will not be fixing any Carbon-specific bugs except for the most egregious. We will continue to support Carbon as a build option until we ship a release of Real Studio that includes a LLVM-based compiler as the default build option. In that release, Carbon will no longer be available as a build option. Transitions are not always easy, but sometimes they are necessary in order for us to move forward. I know that for some of you these transitions will cause some grief but I think you can see that they are necessary if we are to keep making Real Studio better. Real Studio 2011 Release 2 is available for download today. Here is a quick video demonstrating some of the key new features in this release. With new HTML5 features like WebSockets, GeoLocation and WebMoviePlayer, as well as JSON support, Real Studio 2011r2 gives you the essential tools to communicate with online services like Google, Flickr and Twitter. The new release contains 42 new features and 184 improvements, you can read the full release notes here. With Web Edition coming along and more and more feature requests coming in, one of the essentials to making external services work was to add JSON support (http://www.json.org). This nifty protocol written by Douglas Crockford is a way to represent objects as a string so they can be transmitted across the internet. As it turned out, interfacing with Google's Geocoding engine was the perfect opportunity to add JSON to the upcoming Real Studio 2011 Release 2. Building on an open-source library from Charcoal Design, we created a new class named JSONItem. For those of you that don't already know, JSON objects can either contain named items (like a dictionary) or indexed items (like an array). To make these objects a little easier to create, we've added methods so you can manipulate them either way. Values can be Strings, Numbers, Booleans, Nil or another JSONItem. Services that you can communicate with using JSON include Google, WordPress, Twitter, YouTube and Flickr. Since 1984, the operating system for the Mac has always begun with the "Mac" prefix. First it was Mac OS and later, Mac OS X. Apple has been very consistent about that. They never called is "OS 9" or "OS X". Apple always used the "Mac" prefix. But if you look at Apple's page for the next version of the Mac operating system, for the first time, that's no longer the case. Lion is called "OS X Lion" all over their website. Why? I think Apple is trying to transition to a single brand for their mobile and desktop operating systems. Certainly, many of the features in Lion were inspired by features in iOS. And it would make sense for Apple to want their users have a common user experience between their iPhone, iPad and iMac or MacBook. Steve Jobs said that the Mac and PC have been "demoted" by iCloud to being "just another device." Apple is not content for the desktop to be the digital hub because the desktop digital hub is not always available. The cloud is, so by keeping all of your devices in sync via iCloud, they make it easier for you to own more devices. At least, they make it easier to own more Apple devices. And that only makes sense because Apple is a hardware company. So the rebranding of Mac OS X to simply OS X is Apple's first step towards a single name for their two operating systems. One day you will see all the devices they sell as being so similar in user experience that there will be few barriers to stop you from buying more of them. And that's the point, removing the barriers that prevent prospects from becoming customers. What do you think? Why would Apple remove the "Mac" prefix from Mac OS X? On a related note, in this blog post, Bob Cringely stated that the iCloud's real purpose is to kill Windows. iCloud might indeed be the final missing ingredient that makes the iPad a realistic option for Windows users looking to replace their current PC. After all, when considering a new Windows PC versus an iPad, price is no longer an issue. However, I don't think Apple spends time thinking about killing Windows. I think Apple spends its time thinking about creating great products. Anything else that happens is nothing more than a byproduct of that thinking. This all may make me sound like an Apple fanboy. I'm certainly a fan of theirs. However, I'm a fan because they have consistently made great products. There are plenty of companies for which I'm a fan for the same reason. When learning programming, the most common first program one writes is "Hello World" which basically just displays that message. It's a small but significant milestone to be able to produce this simple message. When we were working on adding support for Windows to Real Studio, it was exciting to see "Hello World" on Windows 98! We experienced the same excitement during the development of support for Mac OS X, Linux and the web. When your choose Run or Build in Real Studio, all of the code you wrote is passed to the Real Studio compiler which is represented by the items in grey in this diagram. The front end is the part of the compiler that understands the Realbasic syntax. It converts your code to a sort of meta-assembly language. That meta-code is then passed to the compiler backend which turns it into x86 assembler which your computer can understand. 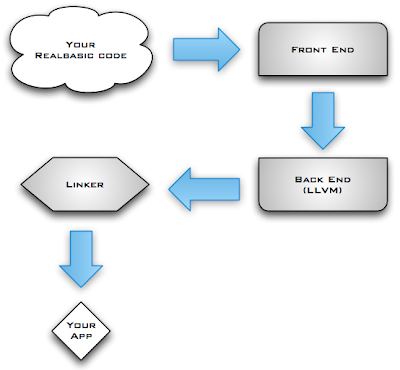 All this compiled code is then passed to the linker which puts it all together and produces the actual application you can distribute. Of course all of this is hidden behind the scenes but it's helpful (or at least mildly interesting) to understand how it works. We have written two different backends for the compiler: one that produces x86 assembler and the other that produces PowerPC assembler. The latter is no longer supported since Apple has stopped making Macs using PowerPC processors. It's an optimizing compiler which means it can make your code run faster. It does dead-code stripping which means it can leave out the parts of the Realbasic framework that your project isn't using resulting in a smaller application. It may enable us to return to a single-file executable on Windows. It supports the ARM processor used in mobile devices such as iPhone/iPad. Last year we took the first step of making RBScript compile with LLVM. The next step is to replace it for building entire applications. We have spent a bit of time on this next step recently. Today we were able to compile and run a "Hello World" console app and a desktop app as well. This is a significant milestone but it's only the first of many. There is still a lot of work to do before you will be building your projects with LLVM but reaching this important "Hello World" milestone is an important one. EDIT: For the sake of clarity, it's possible that some issue might prevent us from achieving single-file executables for Windows. So I have changed "will" to "may" in item #3 above. Also, I have removed mention of Android from item #4 because LLVM doesn't help (or hinder) us when it comes to supporting Android.